How would you guys feel about this? Prices would probably vary depending on the subject, but it prolly wouldn't be too expensive, since this is something I'm just kinda getting into. I ask because I've found that I enjoy making these. I recently updated my own, and I was extremely satisfied with the results. So, whaddya say? Think you guys would like this? I enjoy making them myself. I dunno why, I guess being able to run around in your own world and show off to people that you made your own skin is pretty rewarding in itself. Well, it's just like any other commission, in essence. I suppose it depends on prices and how unique people want to feel while playing Minecraft, but, if the price is right, you could make a little extra on this, I think. Yeah, it's pretty fun seeing my work rendered, albeit on a simple frame. 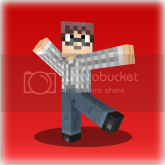 Minecraft Skin Commissions?How would you guys feel about this? Prices would probably vary depending on the subject, but it prolly wouldn't be too expensive, since this is something I'm just kinda getting into.